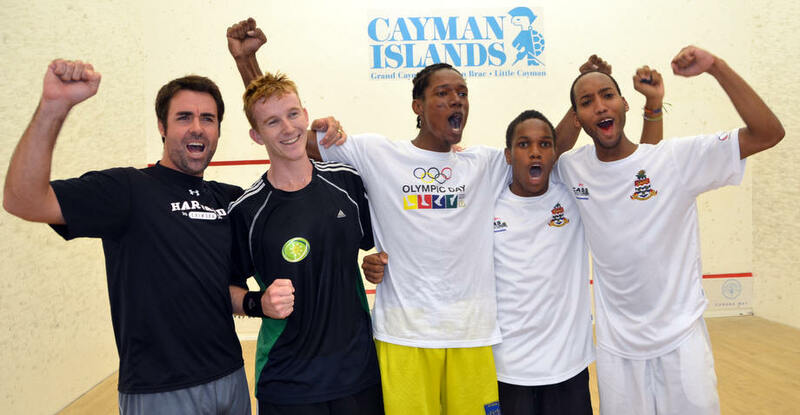 They like their 3-2 matches do the OECS (Organisation of Eastern Caribbean States) team - having come from behind in both their pool matches, they did it again in the final to claim the title for a first time (well, at least since 1977), going one better than last year's second spot. 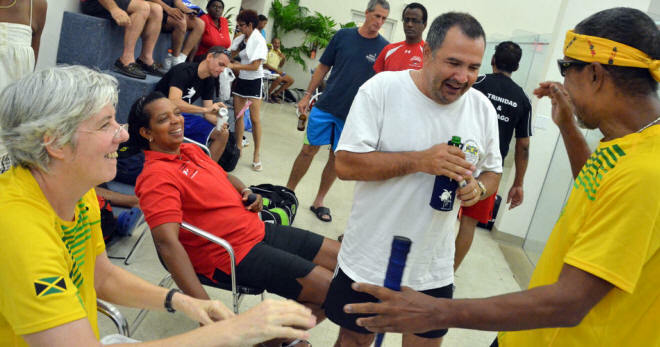 They did it the hard way, coming from two-nil down to Jamaica, just as they did less than 24 hours ago in their Pool A decider! 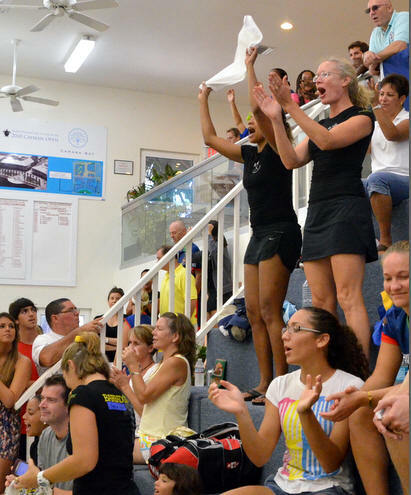 In between times both won their semi-finals to set up the rematch, which, with a barely changed playing order, gave everyone watching a weird sense of Deja Vu. Of course, whether the two strongest teams should have been seeded at #1 and #4 and pitched together into a three-team pool (along with poor old Guyana, whom lost to both 3-2 before winning both their playoff matches) is another matter and outside the scope of this report! 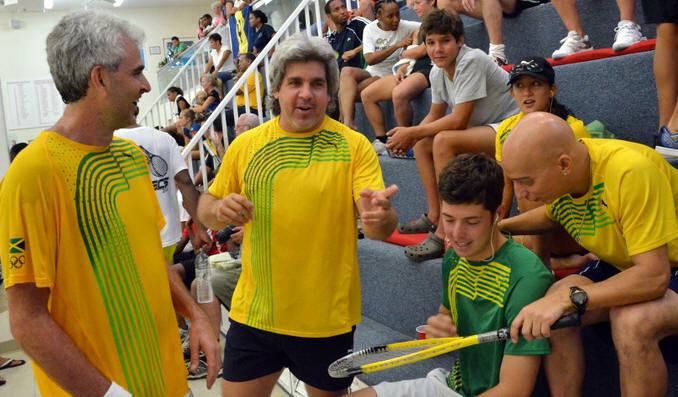 Anyway, it was numbers four and five again, just like yesterday, and again Jamaica managed to take both of them. 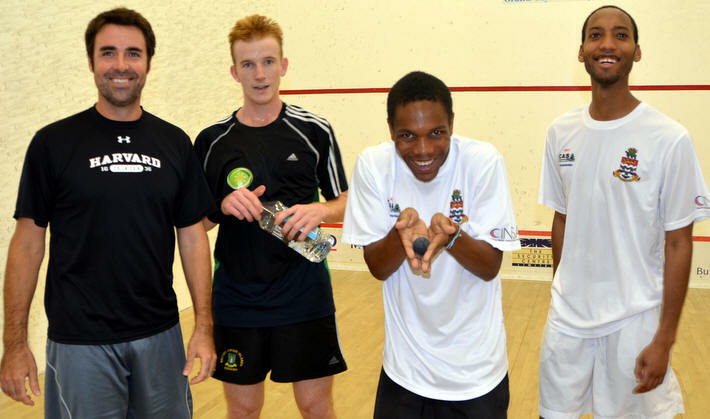 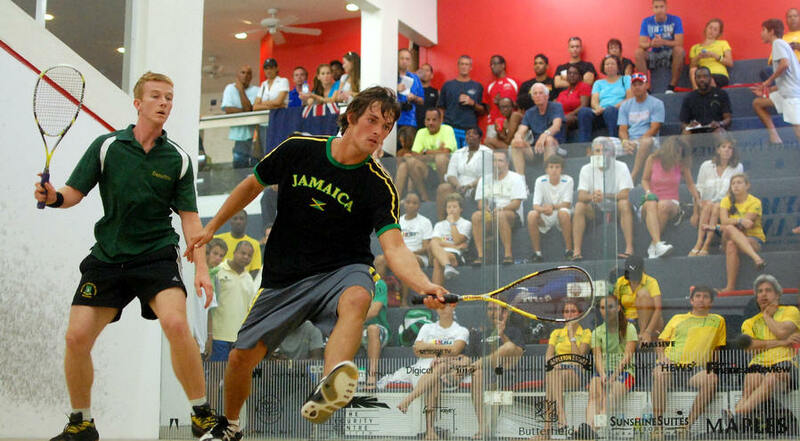 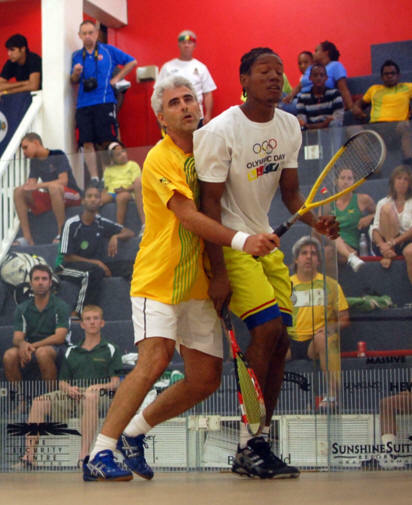 Dave Schweir let a two-game lead slip before reasserting over Kevin Hannaway in the first match before putting Jamaica one ahead, and Chris Bicknell's precise game and superb reach was too much for Kevin Bailey, even though the OECS man took the first game. So once more the third match was individual champion Chris Binnie against the player with the highest (previous) world ranking in the tournament, Joe Kneipp. 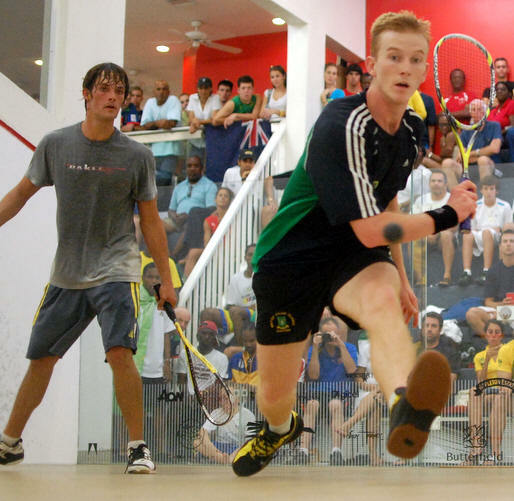 Playing only in the team event, Kneipp was handed a crucial role in all of OECS's matches - yesterday he first had to keep OECS in the hunt by beating Binnie, then had the job of clinching victory over Cayman in the semi-final. 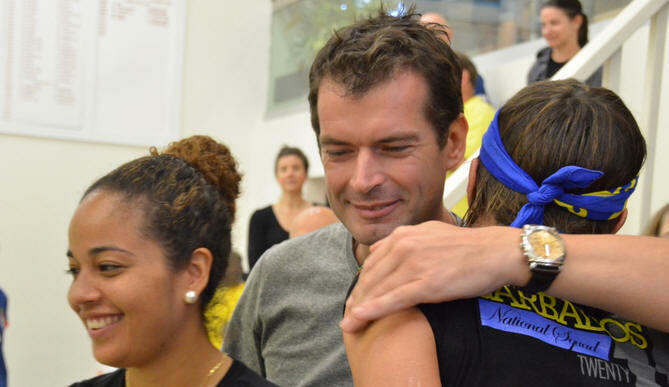 He reprised that role well. 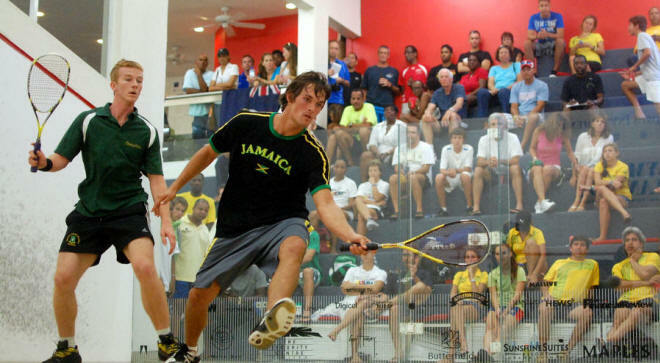 Even though Binnie was more committed than in their previous match, Kneipp still had too much guile, too many shots to call on, and soon enough OECS had pulled one back. 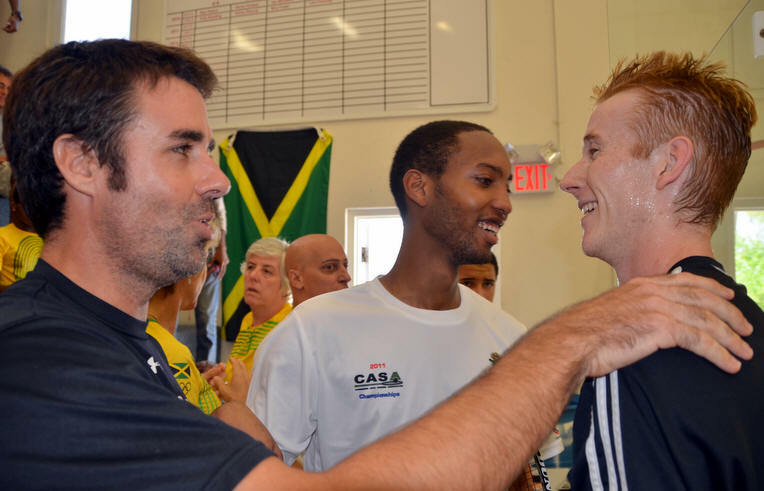 Jamaica's team manager Warren Burrowes yesterday talked about needing to turn one or two of the results around in the final, and the those two matchups were next on court. 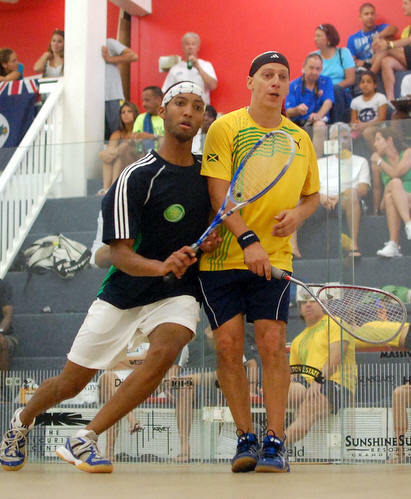 Joey Levy came close to doing it for Jamaica - at one-all Shane Slater was looking the more likely winner, but a determined comeback from well behind almost, but crucially not quite, gave Levy the lead. But after Slater sneaked the third 15/13 he led throughout the fourth to set up the decider. 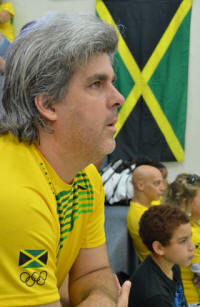 When asked about the possibility of it all being on him, just after Jamaica went two-nil up, OECS's Joe Chapman was unconcerned. "We've had close matches all week and I've always been on last so it doesn't bother me," he said. 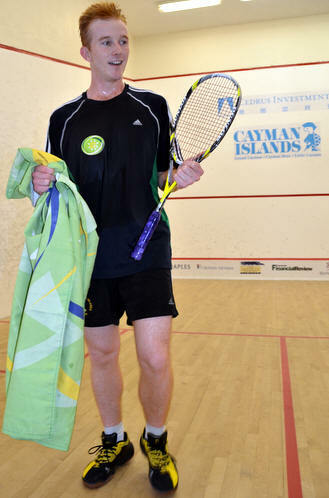 With a 3-0 win over Bruce Burrowes already in the tank from yesterday, Chapman certainly started the favourite, but if you were wanting to build a cyber-squash player, Burrowes would be near the top of your list for his never-say-die ingredient. It was tougher than yesterday, it was much much noisier than yesterday, but Chapman played just as well, just as determined and just as relatively error-free considering the situation, and it was again just enough. 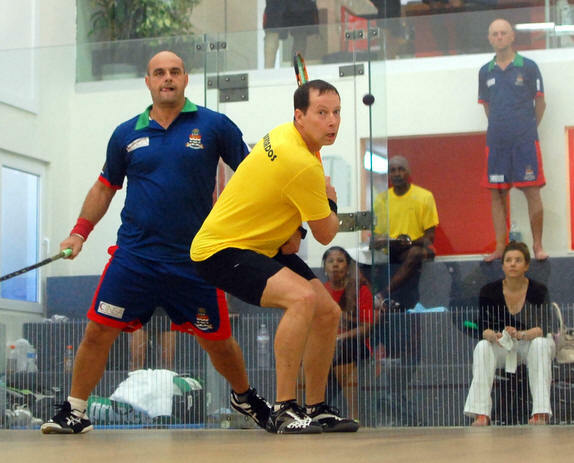 Certainly Burrowes had his chances - a couple of points or decisions going the other way could have swung either of the last two games - but Chapman was again the hero, and didn't he and his teammates enjoy it. 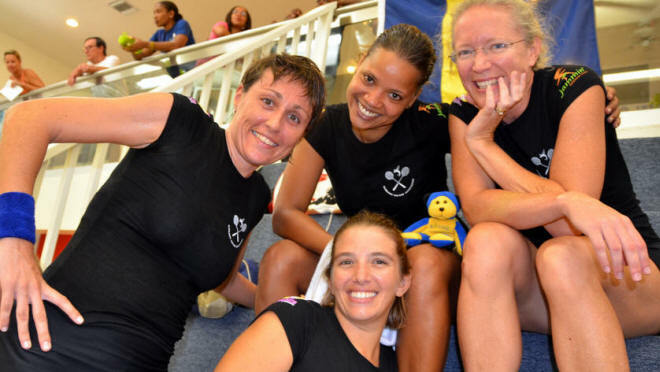 Barbados Ladies once again proved too good for the rest in a women's team tournament which featured just three entries. 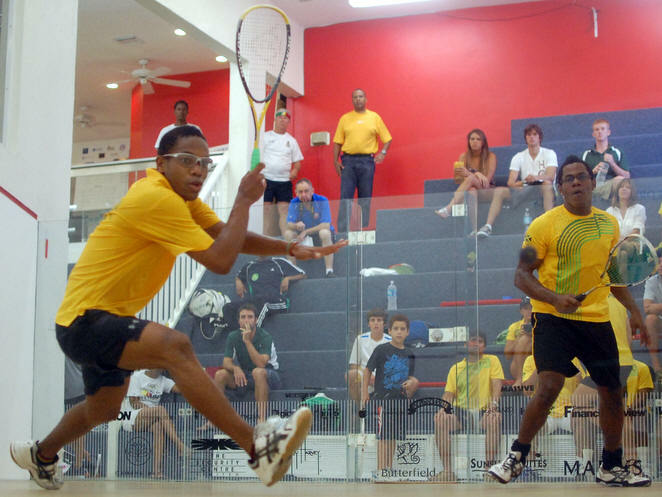 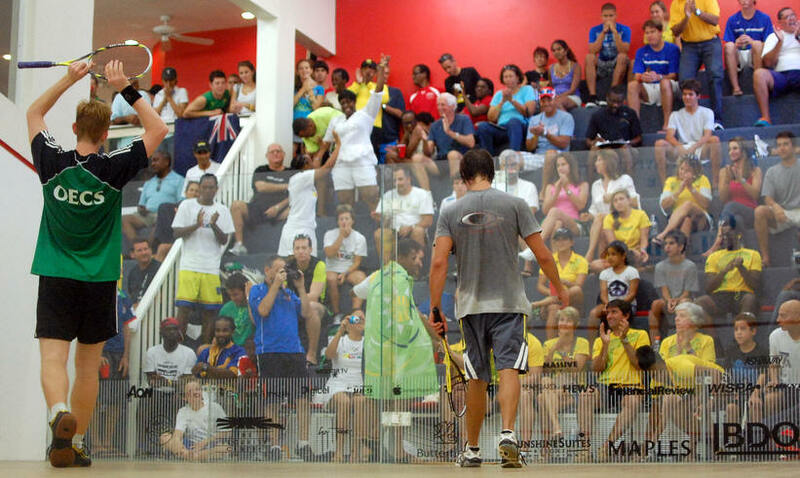 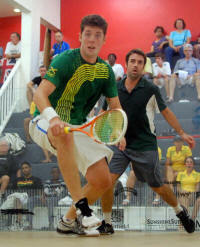 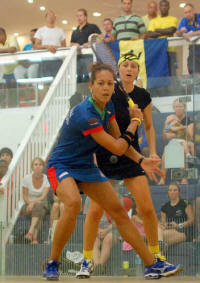 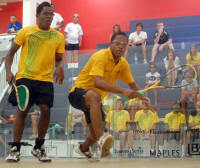 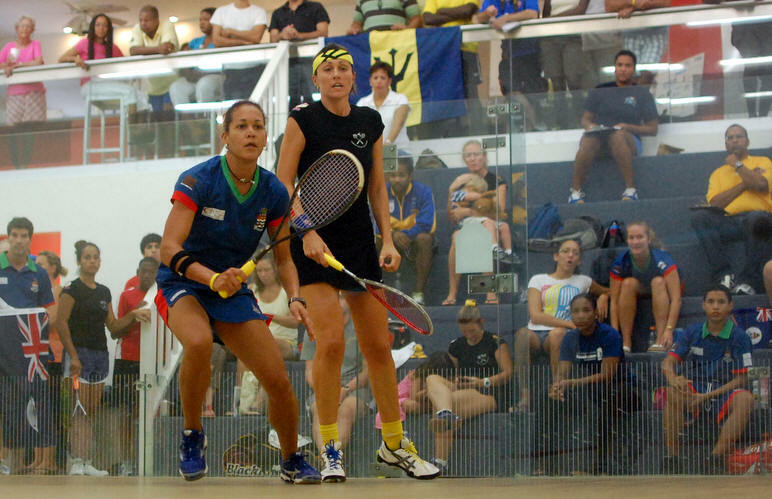 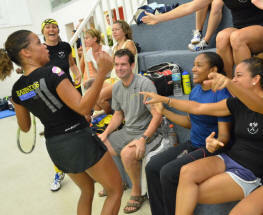 Both having beaten Jamaica, the defending champions faced hosts Cayman Islands in the title decider. Lillian White shrugged off her early exit in the individual event to beat Chantelle Day in straight games, and Alex Jordan recovered from losting the first to beat a rapidly-tiring Eilidh Bridgman in four. 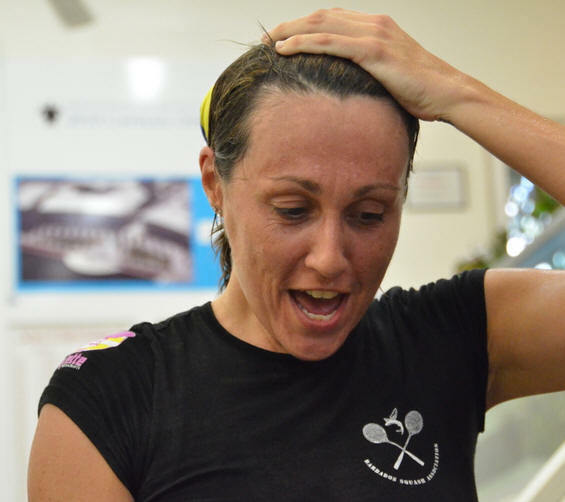 So the scene was set for Karen Meakins, the deposed individual champion of last year, to regain the title, and she started off well enough as she took a two-game advantage. But this wasn't just anyone she was playing, and three-time champion Marlene West had two game balls in the second to equalise before Karen took it 13/11 with some typically determined play. 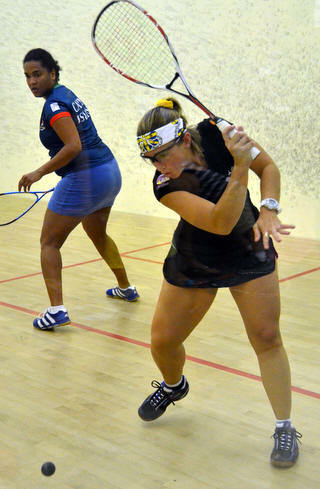 This was quality squash though, and Marlene was doing more than just competing, she began to get the better of things as Meakins' trademark fistpumps grew less frequent. 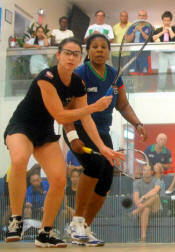 The third and the fourth both went Marlene's way, and at 8-6 in the fifth the match looked as though it still had some legs in it. 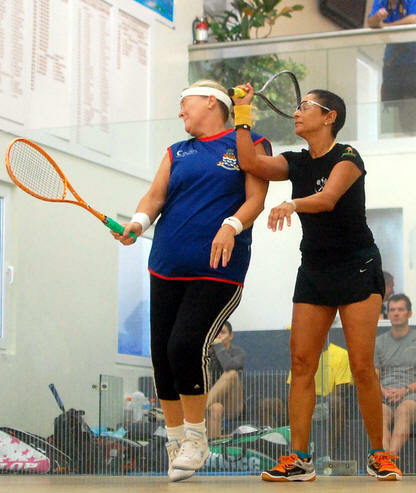 But five points in a row for Karen and the fistpump was back - and as far as Barbados was concerned, so was the title, for the fourth time in six outings. 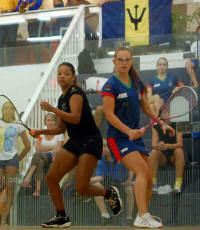 Nadia McCarthy and Cheri-Ann Parris (on her 21st birthday) rounded off the 5-0 win. 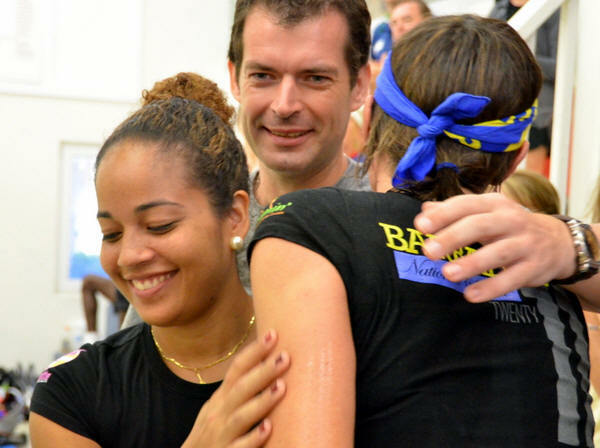 Barbados knew that the overall team title (based on a points system over Men's, Women's and Vets teams) could be theirs, but their first priority was to maintain their unbeaten record in the final pool match against Cayman to avoid any possibility of a complicated countback with themselves, Cayman and Jamaica. 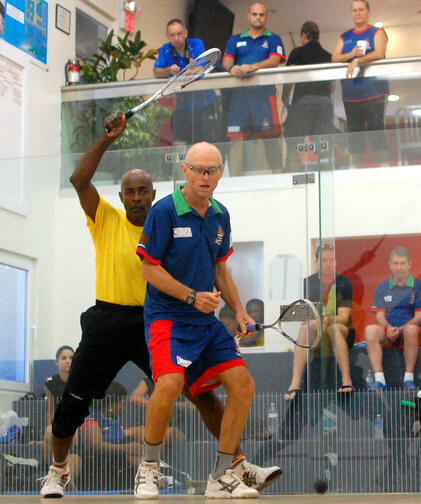 Many-time Cayman champion John MaCrury got the hosts off to a good start, coming from 2-1 down to beat Nigel Griffith, and claim the Men's 50+ title in the process. After that though it was all Barbados as they reeled off the next four matches to take the Vets, and the Overall titles. In the process Mark Sealey and Kristina Evelyn maintained their unbeaten records to take the Men's and Women's 40+ titles. That rendered Jamaica's win over T&T irrelevant in terms of team titles - they finished second in the Vets and the Overall, as well as in the Men's - but it did mean that Douglas Beckford and Gill Binnie took the Men's 60 and Women's 50 titles.